When is a football manager like a controversial ousted ruler? Arsenal twitterdom has found an innovative way to call for an end to Arsene Wenger's 21-year tenure as manager: by comparing him to former Zimbabwean president Robert Mugabe. Comparisons between the two men have been the basis for jokes all season long, but the meme really took off after Arsenal's 2-1 defeat to Brighton over the weekend. And the heat on Wenger has only continued in advance of Thursday's Europa League match against AC Milan. The manager's controversial reign has been the subject of social media debates for years - including constant duelling under the hashtags #WengerIn/#WengerOut. Arsenal has recently lost four games in succession; it's the second time that has happened under Wenger. Robert Mugabe - hero or villain? 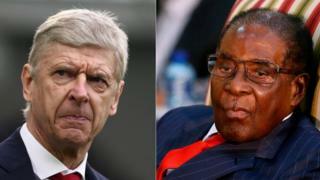 The comparison between Arsenal's manager and Zimbabwe's ex-president seems to have originated as far back as 2016, in a sweary YouTube video posted by ArsenalFanTV - a channel unaffiliated with the club but run by Gunners supporters. In the video, an unnamed Arsenal fan goes on a rant to the amusement of a small crowd of supporters. But the comparison seems to have reverberated far beyond north London - for instance, last year an attendee at an anti-Mugabe rally were spotted with a "Wenger Out" placard. The #WengerOut meme also made it to a concert in Kenya. With nearly 22 years under his belt as Arsenal manager, Wenger is often referred to as the most successful manager in the club's history. But, like Mugabe, is his time up? Do you have a story? Email BBC Trending.